More than 1,800 refugees from Iran, Iraq, Libya, Somalia, Sudan, Syria and Yemen have resettled in the U.S. since a federal court judge suspended key parts of an executive order President Donald Trump signed on Jan. 27 that restricted travel from these seven nations, according to a Pew Research Center analysis of U.S. State Department data. Virtually all of these refugees were admitted after a federal court judge suspended the president’s executive order. Trump’s executive order suspended refugee admissions for 120 days, with the exception of persecuted religious minorities who would be evaluated on a case-by-case basis. In addition, the order barred entry to the U.S. for 90 days for most people who hold citizenship from Iran, Iraq, Libya, Somalia, Sudan, Syria and Yemen. Separately, admission of Syrian refugees was suspended pending a revision of security screening measures. A week later, on Feb. 3, a federal judge in Washington State suspended key parts of Trump’s order, lifting the seven-country travel restrictions, a decision that was upheld by a federal appeals court. Trump is expected to issue a revised executive order next week that would reinstate travel restrictions but will also change who will be affected in order to address the legal concerns surrounding the first order. During the first full week of Trump’s presidency (Jan. 21-27), 870 refugees from the restricted countries entered the U.S., accounting for 43% of all refugee admissions during this time. 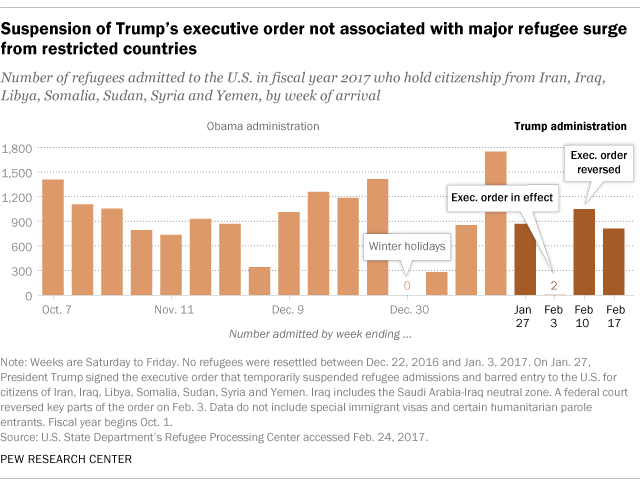 The following week, Jan. 28 to Feb. 3, refugee admissions from the seven restricted countries all but stopped after Trump’s executive order took effect (excluding two refugees from Somalia and Iraq). They then resumed shortly after the federal courts stepped in. In all, including refugees from countries with no travel restrictions, 6,095 refugees entered the U.S. during Trump’s first month in office (Jan. 21 to Feb. 17), a period that includes the week before he issued the travel order. Among these refugees, a total of 2,778 were Muslims (46%) and 2,610 are Christians (43%). So far in fiscal year 2017 (Oct. 1, 2016 to Feb. 17, 2017), refugees who hold citizenship from the seven restricted countries have accounted for nearly half (49%) of 36,217 refugee admissions during this time. Over the remainder of the fiscal year, a maximum of 14,000 more refugees could enter the U.S. if the lower refugee admissions ceiling ordered by Trump remains in effect. Among the seven restricted countries, Syria (5,490), Iraq (5,378) and Somalia (4,480) are the leading nationalities of refugees entering the U.S. in fiscal 2017. Just nine refugees are citizens of Libya or Yemen. Refugees enter the U.S. already approved by the State Department’s Bureau of Population, Refugees and Migration. Applications are screened by the State Department, the Department of Homeland Security’s U.S Citizenship and Immigration Services and other federal agencies. Once approved, refugees undergo a health screening, and most also go through cultural orientations outside of the U.S. The entire process can take up to 18 to 24 months. Although the courts have reversed some parts of Trump’s executive order, the president’s decision to lower the maximum number of refugees admitted in fiscal year 2017 from 110,000 to 50,000 remains in effect. The State Department has alerted resettlement agencies that refugee arrivals will soon end, and refugee resettlement agencies have begun laying off staff.